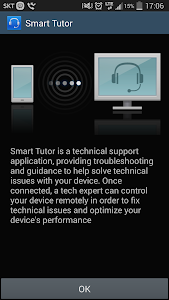 Smart Tutor is an easy, quick and safe means of consulting for Android™ smart phone and tablet series. It can be used to diagnose your device remotely in order to optimize device performance and give functional advice. 1. Download the "Smart Tutor" from Google play store and install on our Android device. 3. Enter the 6 digits connection code given by a tech expert. 4. Once connected, a tech expert will diagnose your mobile. 5. 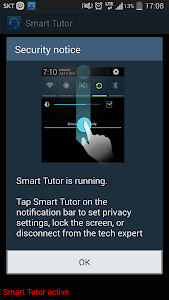 If you want to terminate "Smart Tutor", please tap "Disconnect" menu. e-mail and other throughout special features. 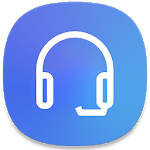 Provide remote support from our Android device quickly and easily if we can use 3G/4G or Wi-Fi. 2. 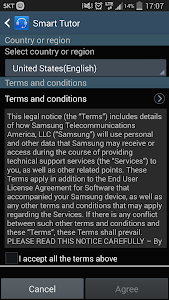 "Google Experience Device" is not supported such as "Galaxy Nexus"
Similar to "Smart Tutor for SAMSUNG Mobile"